The Ambient Noise Player aka ANoise Player is a simple but very useful app that plays sounds that help you boost your productivity, stay focused or it can even help you fall asleep. 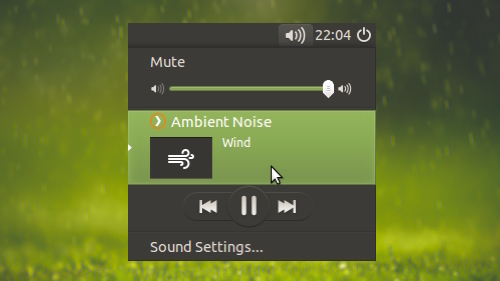 You can access the Ambient Noise options from the Ubuntu Sound Menu which allows you to play various relaxing sounds like storm, rain, wind, forest, night, fire, coffee shop, sea and other custom relaxing sounds provided by community members. After you install it through your Terminal, simply do a search for the application in your Ubuntu Launcher to load it, you only have to do this once, after you do this, the ANoise app will now automatically load for you.